Here is my 1998 W210 E55 AMG Mercedes E-Class. I have owned this car for two years but with a forth coming wedding and too many cars around me , I am selling it to fund the costs .i can be contacted on 07783324577 should you wish to discuss the car further. Anyone that knows these cars will know that the E55 AMG was built to rival BMW's M5 ,the E55 AMG's 5,439cc normally-aspirated V8 motor produces 354hp and a monstrous 390lb ft of torque,the low-profile E55 looked similar to a standard E-Class save for understated AMG body kit, fat AMG alloys and paired exhaust.Power is transmitted to the rear via a five-speed automatic transmission .With 62mph dispatched in just 5.5 seconds the lavish E55 AMG spec included headlamp washers, climate control, heated memory front seats; seat-belt pre-tensioners, leather upholstery with maple-wood dash trim, an adjustable steering column and cruise control. The Performance of these cars is bordering on brutal but, with a communicative chassis and steering, full throttle is rarely required. And if you do overstep the mark the E55's immense torque can be tamed by the traction control. 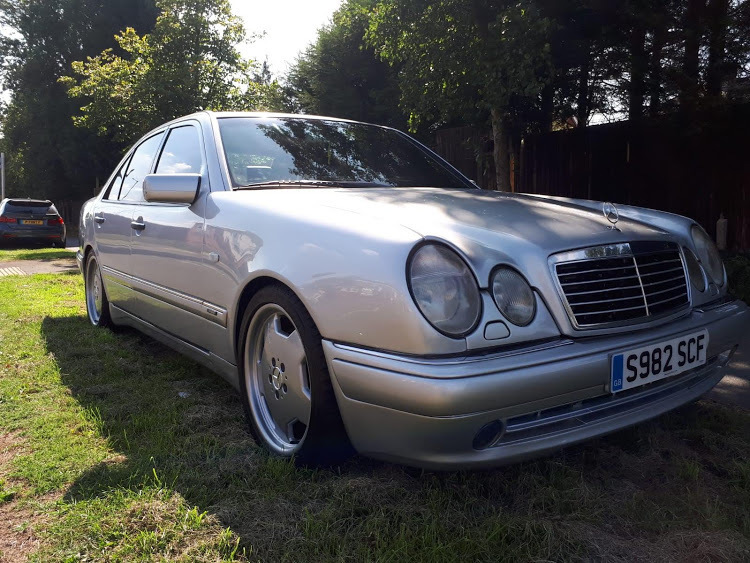 If you fancy buying a W210 then rust is the main issue to look out for, this is not the case with this car ,there is no known rust on any of the bodywork and as the photographs show it is very clean and tidy . The original AMG alloy wheels are present and correct and have also been refurbished . I am told that the automatic gearbox was also refurbished a few years ago by the previous owner although I have no documented evidence of this . The car is fully loaded and is ready for its new keeper , it has the optional extras of a factory fitted electric sunroof and a BOSE sound system which sounds very nice .The car has mot until august 2019 and has covered just less than 127,000 miles from new .The car has had new brake pads fitted all round . I have the v5 with the car and also 8 of the previous mots . unfortunately I do not have the service book . The online mot history does however verify the mileage . As the car is pre 2001 the road tax is just £ 255 for 12 months unlike later examples of this car . Also as the car is now 20 years old it can also be insured on a classic car policy with some insurers . These cars are now appreciating classics and with the bullet proof German engineering they are a pleasure to own and drive. CASH ON COLLECTION ONLY , I MAY do a swap or take a PART EXCHANGE WITH CASH MY WAY. Car valued at £7000 please don't waste your time or mine by offered cars worth alot less and expecting a straight swap. Thanks Roach for uploading the photo. Much appreciated. That's ok, always wanted one of these.... Unfortunately all the good ones come up when I'm in absolutely no position to buy one! Good luck with the sale tho dude! They are fantastic to drive and suprise alot of people when you leave them eating dust when pulling off from traffic lights. Lovely cars the E55s - I've had two of them, ad the last one was bought by Geordie (Chris) of this forum. This one looks like a clean one, although it's a shame there isn't a service booklet with it, as it's important to see these have been looked after. GLWS. These are now going up in price.